Tired of your outdated bathroom? Looking for new ideas and ways to modernize old counters, floors, cabinets and more? Let this powerful software help you create and design the beautiful, functional bath you've always wanted. Be it a complete remodel or a quick makeover, Virtual Architect's bathroom design software gives you everything you need to get started today! 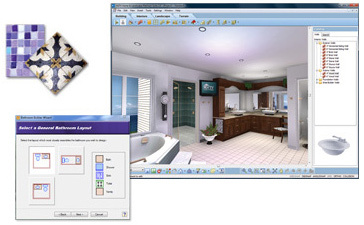 No Design Experience Necessary – Facing a remodel can be a daunting experience but Virtual Architect's bathroom design software makes it easy using a wizard- driven interface. Plus, with Virtual Architect How-To Video Tips included in the software, designing has never been easier!